This is the first of what I hope will be a series of articles on recommended photographic locations in my adopted home, the Italian-speaking Swiss canton of Ticino (sometimes referred to in English by it’s German & French name, Tessin). I’m going to start with a sitting target: a location which is very easy to get to, and has enough photographic potential to fill a book (which it already has). 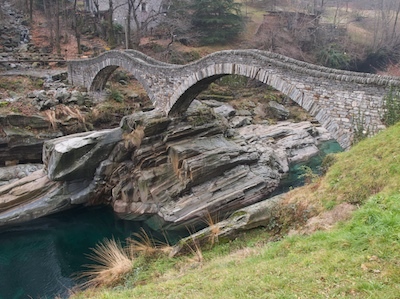 Lavertezzo is a village in the Verzasca valley, and a popular tourist spot. It is known for the double arched 17th century stone bridge (Ponte dei Salti) which spans the river. But it is mainly what lies under the bridge which interests photographers. 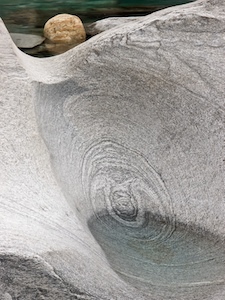 The river has carved and polished a fantastic landscape of complex, wildly patterned and multicoloured stone sculptures, and the river’s startlingly green glacial water alternately pools and rushes through clefts and over falls. It is an ever-changing scene, which rewards return visits and never fails to deliver something new to the observant eye. But it is tricky to photograph. First of all, at least in summer, other people are a major problem. You need to arrive by about 7am, and you can pretty much forget photography after 9am - although you can wander up and down the 25km or so of the valley’s length and find plenty of more secluded spots. The next problem is the light. The rocks tend to be highly reflective, and contrast is a major problem. The harsh overhead sunlight of a Ticino summer makes photography at any other than snapshot level pretty complicated during most of the day… unless, of course, you turn a problem into an advantage and shoot infrared. Unfortunately you’ll probably also need to shoot the tourists. Out of season, it isn’t so tricky. In autumn or spring you can arrive at around 10am, and have the place pretty much to yourself. In winter, you can arrive pretty much any time you want - snow permitting - and be guaranteed to be on your own, although the bridge may be roped off. A polariser is a must, to bring out the deep emerald green of the water, and a couple of neutral density filters would be useful. You can find subjects pretty much at all focal ranges, although my personal preference tends to be to focus on details using medium to long focal lengths. 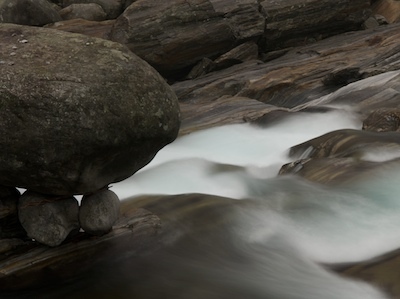 A tripod is strongly recommended as you will usually want to take fairly long exposures. It is extremely important to wear good shoes with plenty of grip. 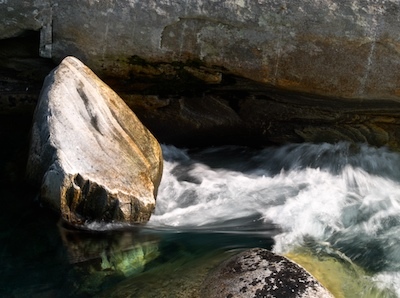 Watch out for wet patches on the rocks - they can be very slippery, and you do NOT want to fall into this river. In winter be very cautious and look out for ice. Otherwise, summer temperatures tend towards to low to mid 20s (Centigrade, obviously) and in winter are usually close to or up to 10 degrees below freezing. It’s easy: the Versazca river flows into the northern end of Lake Maggiore, near Tenero, a few km north of Locarno. The valley road starts in the centre of the village of Gordola, easily reached from the main Locarno - Bellinzona road. The valley road is clearly signposted “Valle Verzasca”. The road climbs quickly with many twists and turns, until it reaches the foot of the Versazca dam (of James Bond fame), then goes through a series of twisty tunnels until it straightens up (relatively speaking) above the dam. Just carry on for about 10km until you reach Lavertezzo. There is a bus service from Locarno which serves the whole valley. The first bus may just arrive early enough for you to get some photography done, but it is better in this case to drive. Read more about Lavertezzo at MySwitzerland.com.